We are an Award-Winning web design agency based in Haslemere (on the Hampshire border). We can help guide you through the process of getting your website designed or re-designed. We have web design packages for all budgets starting at £500 including a powerful website management tool so you can update and change your own content and images. Our clients are from all over Surrey and Hampshire including Petersfield, Liphook and Haslemere. If you don’t know where to start or are confused by all the options, call us in Haslemere on 01428 788170 or complete our contact form and we can guide you through the process of getting your business online. Do you need a responsive website? 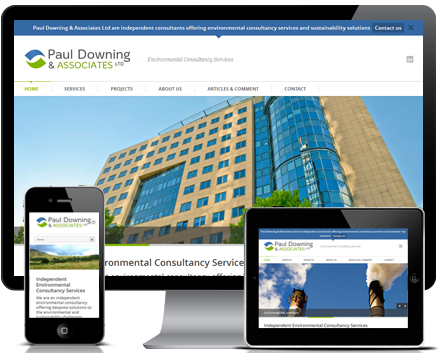 A responsive design ensures your website always look good no matter what device is being used to view it – for example, change the browser size on this website and see what happens… You may already be looking at this website on an ipad or smartphone. If you are ready with your web page wording and the website is relatively small, you could be up and running within 2/3 weeks depending on our current project load. Can I update my website? Updating your website through a content management system gives you the power to change, add and grow your website. This is the real power behind search engine success as Google loves fresh interesting content for your audience. The most common question we get asked and it really does depend on what you want the website to do – We have a solution for every budget so call us and we can help. Redhead is a digital marketing agency based in Haslemere Surrey. We provide Web, SEO & Digital Consultancy services to the local area including Guildford, Petersfield, Farnham and Godalming, as well as throughout the UK.